I narrowed the field down to four players (weirdly, they each had last names beginning with "H" - Heath, Hegan, Hodapp, and Hale) before making my final pick. Each of these guys exhibited reasons to be chosen, but Hegan's longevity (14 seasons), his All-Star appearances (5), his two World Series showings, and his amazing defensive (and offensive for that matter) skills sent him to the top. 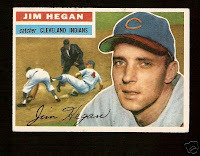 So, my choice for all-time Indians Uniform #4 is Jim Hegan! My dad was a farm league coach in the 70's in South Dakota. For some reason the team would get old game worn pro jerseys from the Indians (I'm assuming they were in their system). Only 4 years old, I had the sense to ask to keep one...it was Jim Hegan's (still had "hegan" stiched in the tag). None of the other jersey's my dad had survived, but I kept good care of mine, along with my dad's baseball card collection which I found bound by rubber bands and stored under a crawl space in our house. Along with one of each of the Topps cards for his years in the league, I eventually had the jersey framed as an adult. One of the great pieces of history I'll pass down to my grandsons some day.